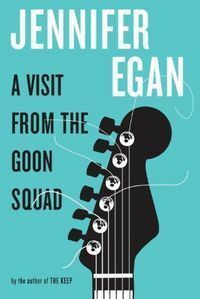 A Visit from the Goon Squad by Jennifer Egan won the Pulitzer Prize for fiction. A couple of years ago, everyone was talking about, so I bought a copy, but I never got around to reading it, until now. Of course, I’d read bits of it–a couple of excerpts were in The New Yorker and I think one story was also in Best American Short Stories. But I hadn’t quite got a handle on what the book was really about. I’ve read it now, mostly because I’m attending a seminar this weekend at Washington & Lee University at which Jennifer Egan is the guest of honor, and the primary topic of discussion will be A Visit from the Goon Squad. As I began reading, I was disappointed. The stories that make up the book are clever, and the linkages are kind of fun to follow, but the stories seemed to be disparate, although linked by the various characters involved in the music business. But for me the book is rescued by the very last story, “Pure Language,” which leaps into a future in which “handsets”–iPhones, more or less–are even more ubiquitous than they are now. In the story, Alex, who had a brief encounter many years earlier with Sasha, one of the main characters, is surreptitiously working as a parrot to help spread word of mouth for a PR campaign. The primary tool is the handset, and the campaign is successful, a terrible prophecy that is already coming true. I’m looking forward to the discussion this weekend!